NextGEOSS is the next generation of the Global Earth Observation System of Systems. The H2020 NextGEOSS project, a European contribution to GEOSS, will develop the next generation of European Earth Observation data broker where users can access data and deploy applications close to the data. Through the cloud, a community of users will benefit from an integrated data ecosystem. The project also involves the creation of a community and will explore its capacities for learning and collective intelligence. The NextGEOSS project will implement a unique point of entry for Earth observation data, including user-friendly tools for exploring this data. The consortium is composed of leading European companies and institutions, active in many GEO-related activities and many other European, and international projects. Leader of the WP3.2 Marine, CLS will enable full compatibility and connectivity between the Copernicus Marine Service and the NextGEOSS European data hub. Moreover, WP3.2 Marine aims at broadening the uptake of the Copernicus Marine data by the entire GEOSS community by facilitating its discovery and access. Moreover CLS will work on integrating its own open datastore to complement the CMEMS catalogue, and enrich the open marine data offering at national and regional levels. CLS will also lead WP5.4 User Management, contributing with its experience with the User Management Application developed for CMEMS based on its open source software, and will participate in WP8.1 Communication and Dissemination. 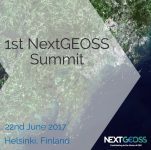 The 1st NextGEOSS summit is being held in Helsinki on June 22, immediately following the European GEO Workshop.